We are happy to announce this upgrade after a long hiatus on official updates. More and more, we move closer to a final v1.0 version providing the software we have imagined from the beginning. Along the way we’ve had tons of suggestions and feedback, and we thank everyone who participated in those types of discussions. We have all pitched in to this effort, and behind the scenes we are extremely grateful for those in the buying club communities. Big picture, we are working towards a version 1.0 of the software, and this release is one of a few as we travel the path to that final destination. For us, that means getting every idea we’ve experienced in to the software for the simplest experience in running a buying club. With this release we offer a few final and unseen new features and a major bug fix, move forward towards v0.6 that we hope to launch later this winter, and it is our hope that by Winter of 2013 we launch a final 1.0 version. Because life is never predictable, these timelines may become longer or shorter. We hope the later, but as of today this is realistic for us, and gives us plenty of time to figure out what comes next in v2.0. 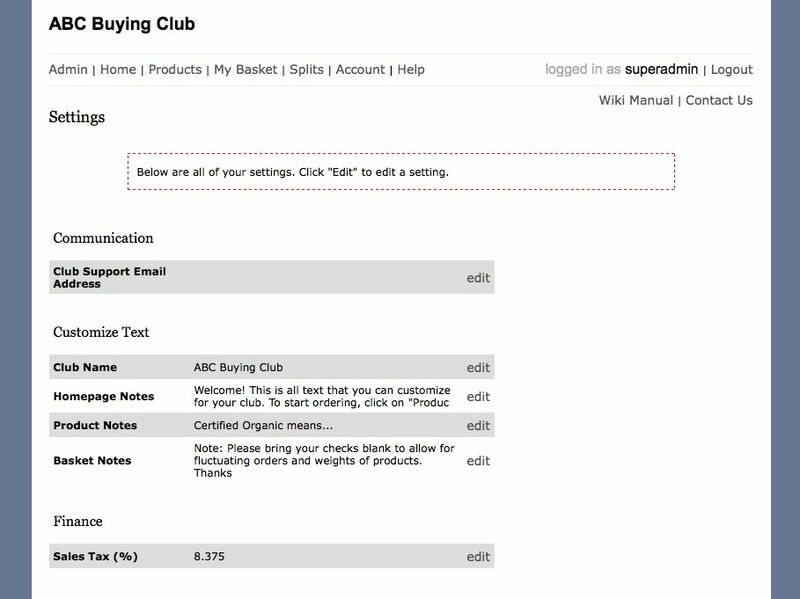 “Help” button on the shopping side(for shopping members) can now be customized to a specific member of your team. ‘Save & Continue’ and ‘Save & Done’ buttons in checkout. These buttons made it easier for those running checkout(often called cashiers) to quickly make the right changes and moves through checkout. Clicking the ‘save & continue’ button reloads the page and recalculates any financial adjustments you make. ‘Save & done’ saves whatever you have done and returns you to the list of members to checkout. 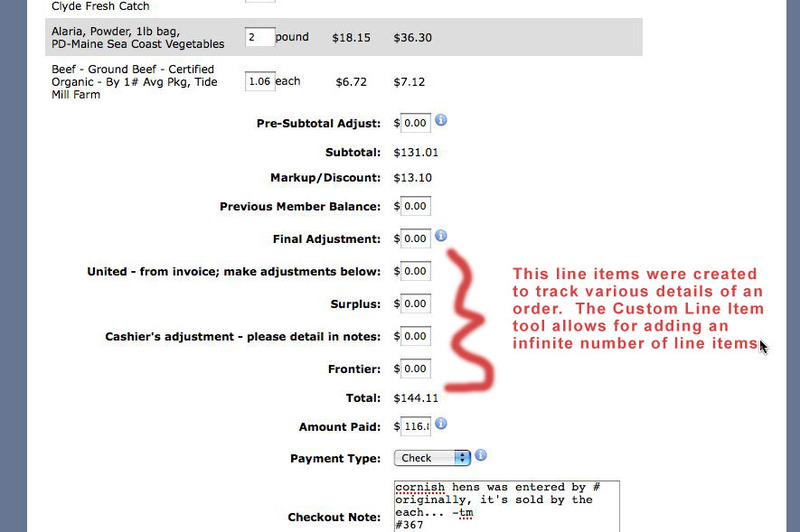 The ‘custom checkout line item’ tool was created for letting clubs add any extra line items they need during checkout in order to easily manipulate the final totals your club needs. These line items are also added up and displayed in the exported spreadsheet of the order. The ‘create new order’ tool in checkout was so cashiers could easily add someone that did not place an order previously. We find the case for this is mostly for clubs selling surplus, or extra, items. Choose a member and one product from the drop-down menus, click the ‘Create’ button, and they are added to the order. Split admin screen that visually separates the two major sections of the software. This was done to help clarify the two major elements of the software. The left is setup and managing open/closed orders, and the right is for processing orders AFTER commit when the order is closed and being processed from Editing Splits and Compiling to Checkout. 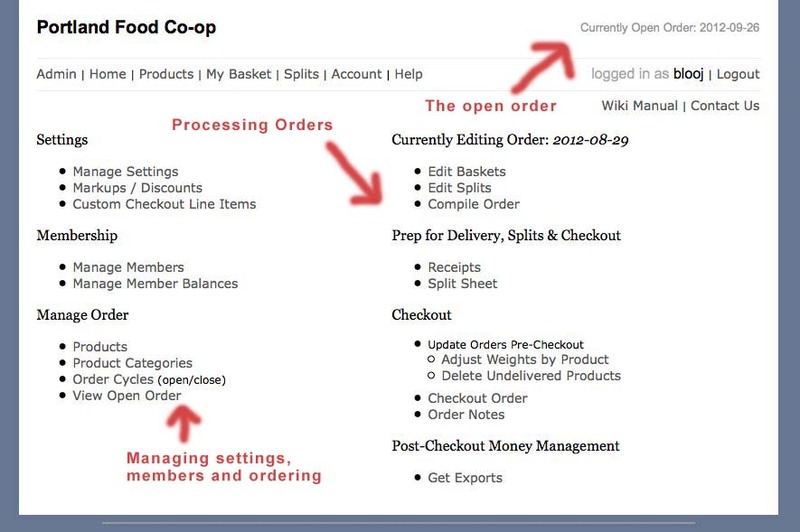 “Currently Open Order” is shown on upper right of page when an order is open. When an order is closed, nothing is shown in this area. You can tell members that if they don’t see that, the order isn’t open. We hope this helps in your communication with your group. 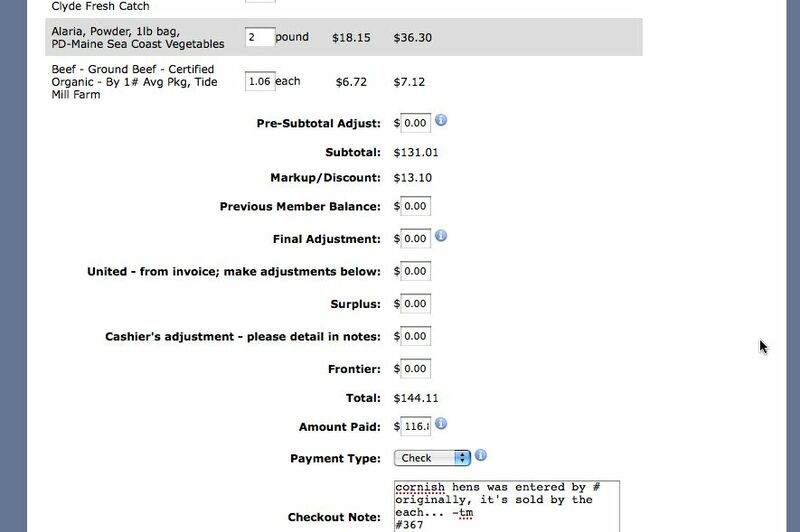 Single Order Processing – Removal of Drop-down Menu in Admin tools. Clients will recognize the image below as the drop-down menu we are referring to. This function was for an original vision of the software that we chose not to follow that added a step to accessing all of the tools in the software. From client feedback and not needing it functionally, we say goodbye to the annoying drop-down that lost it’s purpose. Clicking on any of the tools now goes direct to the order results you are editing that is stated at the top of the page. Removing this step makes processing an order much smoother. “Manage Settings” is a new area for the more permanent settings of the software. In one place, you change the tax rate, the customized text, and the email address that will receive help emails. This is where any future settings will live. 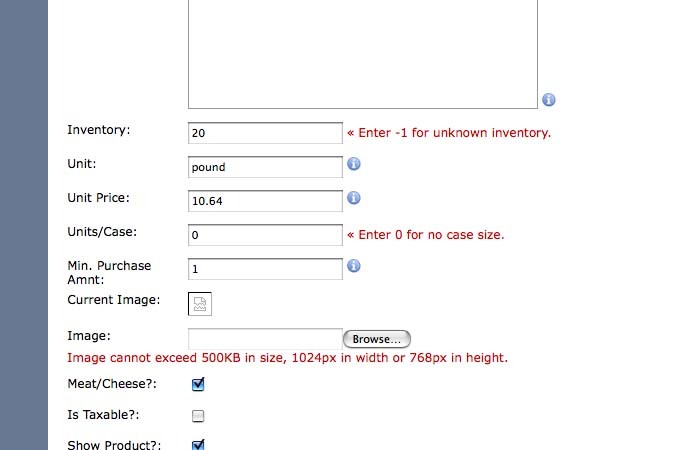 Enter the number you want to make available and when it goes down to “0” the product will be removed from the product catalog. Got any thoughts about our development? Ideas about features we haven’t mentioned? Please leave a comment below or email us at help [at] buyingclubsoftware.org.